Do the sales in your WooCommerce store depend on SEO and the the SERPS (search engine result pages) of search engines like Google and Bing? Do some of your products reach page one or two in the search results? What if your product could be listed two or even three times on the first search result page in Google? Then your chance of selling the product would increase tenfold. So how can you accomplish this when you know that Google will not display your product several times on the same page? Well, you will have to make them list it several times! Here’s how. You have to make several web shops selling the same product. Creating several web shops is easy, but to handle multiple stocks and inventories can be really time consuming and boring. That’s why we’ve created the WooCommerce Multistore plugin to make life simpler for ecommerce entrepreneurs and to help them boost sales. With our plugin you can make several shops sell the same product from the same stock. To get Google to display your product several times in their SERP you can apply a slightly different title, description and price to the same product in each shop. 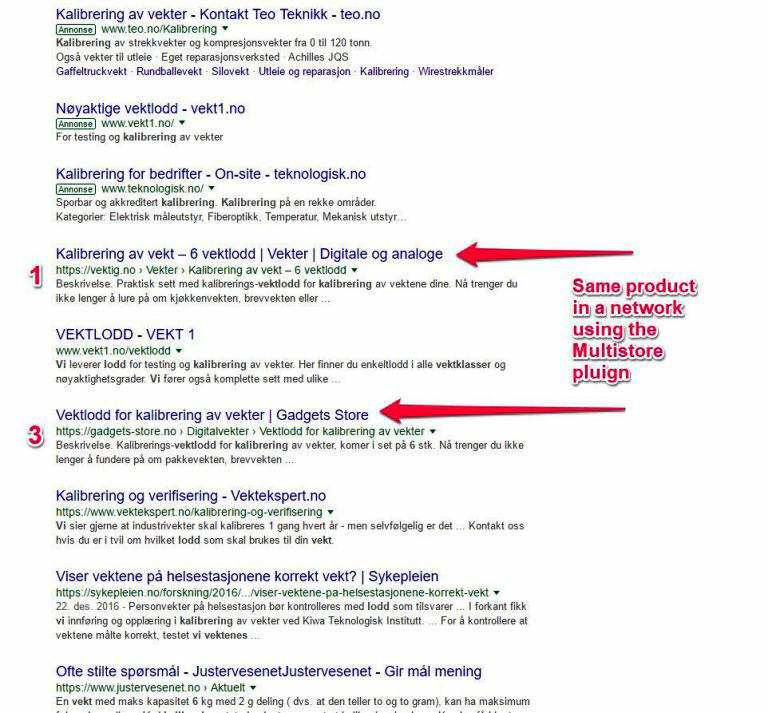 Google (and everyone else) will think that it is two or more different companies selling the product and give them all the same chance to appear in the SERP. You can also do more to make the stores different, like using different categories, different themes for the shops, different tags and so on. It’s even possible to use stores with a different language and currency. The image below is an example of someone in Norway selling digital scales using our Multistore plugin. He has taken both the 1st and 3rd spots on the same SERP for two different web stores, with the same product from the same stock. When an item is sold at vektig.no the stock is reduced for both vektig.no and gadgets-store.no and vice versa.